For all the talk of the Rainiers game overshadowing the M’s, I feel weird posting this after what Felix did to the Red Sox tonight. The quotes coming out of the Sox locker room *almost* make me wish I’d stayed home and watched that game. 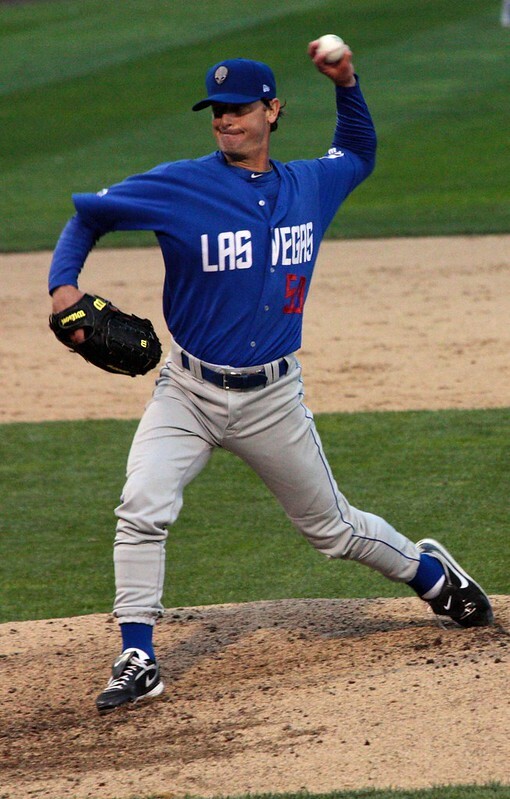 But I wasn’t – I was at a sold-out Cheney Stadium watching Danny Hultzen take on Jamie Moyer and the Las Vegas 51s. Hultzen’s AAA debut last week in Colorado Springs was something of a disaster: 5 runs and 5 BBs in only 3 IP. Tonight’s was better in every respect, though its length and Hultzen’s struggles in the second inning leave plenty for him to work on. With another 4 walks in tonight’s 4 innings, he’s now up to 9 walks overall in just 7 IP, He’s got 9 strikeout too, but… 9 walks. In Hultzen’s first inning, he used a very well-located fastball that sat at 92 MPH and a sweeping slider that annihilated Blue Jays prospect Anthony Gose. In all, he got through the first on only 10 pitches and picked up two strikeouts. The second inning was a very different story. After a lead-off single, Hultzen suddenly lost his command. It wasn’t one pitch, and it wasn’t just one batter – he was missing up, in, down. He walked the second hitter, then went 3-0 on the next hitter before coming all the way back to get a huge strikeout. After wresting momentum back from the 51s, Hultzen walked the next hitter on four pitches, loading the bases, and walked the 8th hitter in the line-up to force in a run. I’m still not sure what changed; one minute, he was painting the black, and another he couldn’t throw a 3-0 strike. It wasn’t just his fastball – he probably threw more change-ups in that inning than in any other (he threw more of everything in that inning, of course), but couldn’t find the zone with anything. On the positive side, he hit 96 on the gun – this wasn’t just a case of a pitcher reaching back for something extra and missing everything; these “extra’ FBs found the zone about as often as their slower cousins. Hultzen settled down after the rocky 2nd inning with a relatively quick 3rd, but had to pitch around another walk and single in the fourth and found his pitch count at 90. In his last at-bat, against SS Adeiny Hechevarria, Hultzen hit 96 and 95 before getting the lead-off man to ground out. While it’d be nice to see what he’s capable of later in a game, to maintain peak velocity after 85-90 pitches isn’t insignificant, and it helps reinforce that Hultzen isn’t just a command/control lefty without stuff. His high-end velocity matched Trevor Bauer’s, for example, and Hultzen’s a lefty. To be fair, he also reinforced the fact that he’s not a command/control lefty by demonstrating essentially no command/control at times, and falling behind hitters he has no business falling behind. Even some of the outs – a fly out by punchless #9 hitter Jonathan Diaz comes to mind – were good results on bad pitches; centered fastball that found gloves. All in all, his slider was perhaps a bit better than I’d heard, with hard break away from left-handed batters. It came in around 80-81, and he ended up using it against both lefties and righties. It got swinging strikes against both, and at one point I thought we might get to witness the humiliating whiff-on-a-HBP that you sometimes see at lower levels. On the other hand, I didn’t see enough of his change-up to really get a feel for the pitch. I’ve seen rapturous reports about it, and others that are more measured, but I’ve always seen it referred to as his primary off-speed pitch, and his primary weapon. Maybe it was a one-game thing, trying to go against a scouting report that would’ve been the only thing the 51s hitters knew about Hultzen. It also could’ve been just a bad day for the pitch, and he shelved it when he saw he wasn’t commanding it. Either way, it was good to see Hultzen fight through without his best stuff and still strike out 6 batters in 4 innings. The painful second inning burned through his pitch count, and Hultzen left after four innings. Darren Ford led off for Tacoma with an attempted bunt that just went foul, then reached on an IF single. Jamie Moyer was clearly uninterested in holding the speedy Ford on, as the Rainiers CF stole 2B easily and took third shortly after. Moyer struck out Nick Franklin and then Alex Liddi on change-ups, and it looked like he might escape without allowing a run. But Luis Jimenez lined a HR to left-center, illustrating Moyer’s problems with the long ball. After a line-drive single and a walk (to Carlos Peguero), Moyer finally got out of the first. Adam Moore hit another HR in the second, and Nick Franklin lined a shot into the corner in RF for a triple; the overall impression was that Moyer could toy with aggressive hitters like Liddi and Triunfel, but every mistake was hit hard. You can’t really “scout” Jamie Moyer – the batters will tell you how he’s pitching, and through two, it looked like the end of the line for Moyer. But then something changed – I don’t know if a 49 year old has nerves pitching in his second ever PCL start (he got a standing ovation from the Tacoma crowd before the game) or if he was still learning about the Tacoma line-up – and he rattled off 8 straight outs and didn’t give up another run. 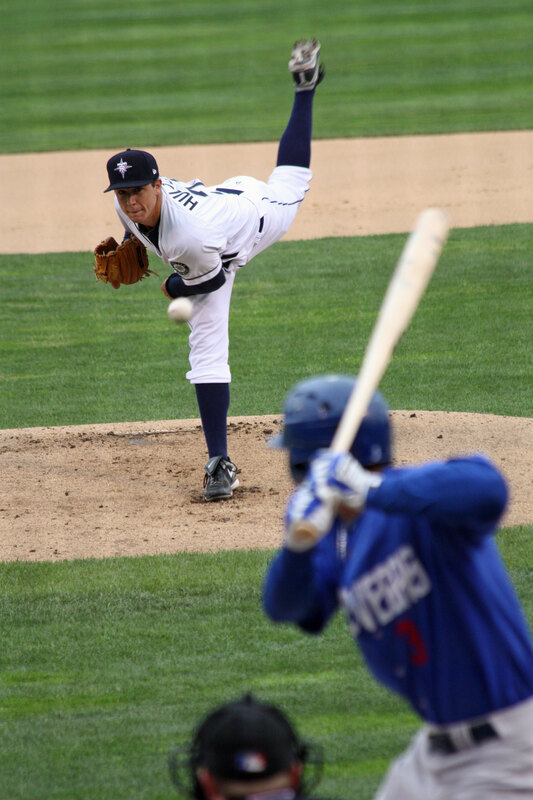 When the 51s went off on Tacoma reliever Steven Hensley, Moyer ended up the winning pitcher. This isn’t a fairy-tale for him, as his performance wasn’t exactly major league quality on the whole, but it was another step in the strangest career I’ve ever heard about, and I’m glad I got to see it. If you’re interested, check out Hultzen’s interview after the game that the TNT’s Ryan Divish posted – some good questions, and some fairly forthright answers. I predict Hultzen will rapidly adapt, and two months from now we’ll be talking about how he doesn’t get to see any real competition at AAA. Jamie Moyer, in a Las Vegas jersey with an alien on his cap. Great atmosphere at the park-many people were excited to see Jamie or Hultzen or (like me) both. In person, Hultzen clearly does have deception in his delivery. I was a bit skeptical of claims that his velocity would play up, but even the better hitters were consistently behind Hultzen’s fastball. This was true even for his less impressive offerings at 91 and 92 mph and when thrown in counts when hitters were sitting fastball. The outcome of Hultzen’s delivery, arm-slot, relatively short throwing path, and whatever other deceptive tactics he employs was many uncomfortable ABs. Seems like he can do the same to MLB hitters. I don’t know, there might be an argument that Jamie is an alien. Excellent writeup. I get impatient to see some or all of Cerberus, but from this it really seems like Hultzen is exactly where he needs to be, and is developing just fine. I’m pretty impressed that he settled himself down to work out of the trouble he got himself into. Do games like this get called by the catcher or from the bench? I don’t know if some of his troubles came from sub-optimal pitch selection. Though mysteriously losing command sounds (to my completely untrained brain) like there was some tiny mechanical flaw in delivery that cropped up. And, anyone in the crowd imploring Jamie to come home? Would love to see him sign a one-day contract and pitch the last home game of the year at Safeco. I too chose to make the trek from Seattle to Tacoma to watch this game and appreciate the write up. I disagree with your skepticism about the change though. I really thought it was a good pitch. He had some command issues with it, but there were a couple that had a good amount of drop and a good speed change (low 80s in comparison to his low-to-mid 90s fastball). I for one was impressed with Hultzen. I’d also like to add that seeing Nick Franklin in person for the first time made me even more optimistic. It wasn’t so much the plays he made (very few chances and actually cost us a double play with a bad throw [yes Liddi could have picked it but still]). It was more everything else. I know this isn’t the site for “intangibles” but the guy just played correctly. He would move a step or two to his left or right in anticipation, he went out to talk to Hultzen after his first walk of the second (almost like he could sense something coming) and he was the highest energy guy in the dugout and on the field. Watching Truinfel stand like his feet were cemented to the ground between pitches and Franklin try to anticipate, chatter, and just be engaged in the game really illustrated the difference for me. As far as tangibles though, for a guy that I had heard might have to give up switch hitting, he looked really good at this dish right handed. The triple wasn’t scorched but it was a low and away slow pitch that he waited back on and hit right down the line. Then later he turned on an inside fastball for a single into left. He really impressed me and I can’t wait to see him in Seattle (not that I’m saying now, just looking forward to when it does come). Marcus, I’d suspect if a guy “just plays correctly” it should eventually be reflected in his numbers. So maybe it’s not as intangible as it might seem at first glance. I missed all the good parts, I’m afraid; we got caught in traffic and didn’t arrive until the bottom of the third. The lowlight of the evening for me, besides Steven Hensley pitching like he didn’t belong in a uniform at all, was Truinfel’s two consecutive awful throws over Liddi’s head. Liddi is no first baseman (my sense on the Franklin throw was that he didn’t have his foot on the bag), but Manute Bol couldn’t have caught these on Wilt Chamberlain’s shoulders. Westy, yeah I agree. I guess I was mostly saying that it’s stuff that is much harder to quantify. It’s not like saying I really liked Jiminez’s opposite field homer because it really showed his power. But yes, I do think it well play a huge role in his success. And Breadbaker, yeah he pulled his foot as he was stretching to pick the ball. Yes the guy was safe because the throw pulled him off, but if he had stayed back and picked it better (which was what I was trying, in vain, to say) then it would have been an out. Also, completely agree on Truinfel. Perhaps it was just a bad day for him but I came away thinking much less of him than when I arrived at Cheney that is for sure. I hope that Triunfel isn’t forcing Franklin prematurely to second. That feels backwards to me. When did he throw the change-ups that you really liked? What happened? I just want to go back and think about those at-bats. The ones I saw indeed had about a 10 mph gap, and they were pretty well disguised, and had some sink. All told, it was a decent pitch, but he wasn’t commanding it. He needed to get them in the zone, and that didn’t happen as much. I also didn’t see many whiffs on the pitch, and against that line-up, he really should’ve gotten a bunch of them. I still think it was *very* interesting that he went to his slider against righties so often… and he got swinging strikes with that pitch. Again, the reports on his change-up have been glowing, so I don’t doubt it’s good, but I still say it hasn’t really been effective yet in his seven innings of AAA baseball. That’s good in a way – he’s got plenty more to show us. Triunfel and Franklin are switching off. Franklin’s played a few games at SS since coming up. Breadbaker – those two throws were hilarious. Two identical plays back to back and two (nearly) identical air-mailed throws. Liddi isn’t a great 1B, no, and he’s not a good LF. The whole R’s defense is much better with Liddi at 3B and Catricala in LF/1B. Marc, I thought that, but at least once (maybe twice), Triunfel’s been out of the line up when Franklin started at SS. I’m glad Franklin’s playing most days, at least, even if he doesn’t seem to be getting preference at SS when they both play thus far. Well, if they keep Triunfel out of the line-up and play Franklin at SS and Luis Rodriguez at 2B, I won’t be too broken up about it. Franklin needs plate appearances. If they job share a bit and move people around such that he’s able to be in the line-up every day, that’s fine. I can’t say I’m positive if my recollection is correct but I believe he threw one to one of their better hitters (I really think it was Yan Gomes) that was just off the plate and dropped just below the knees that he swung through. Also if I remember correctly one of the two Truinfel errors game on a good change up down and away that the hitter rolled over. I wouldn’t say it was consistently great but it showed flashes of being a plus pitch at the big league level at least.